What changes will make the 2020 Mazda CX-3 different? Hopefully, advanced driver-assistance features will become standard on all versions of this subcompact crossover, not just the most expensive trim. To Mazda’s credit, all ’20 CX-3s will continue with blind-spot and rear-cross-traffic detection as standard. It made the safety of its iActivesense Package standard for model-year-2019 on the CX-3’s top-line Grand Touring model and optional on the base Sport and midlevel Touring versions. But rivals are quickly moving to make some iActivesense features, such as autonomous emergency braking, standard across the board. 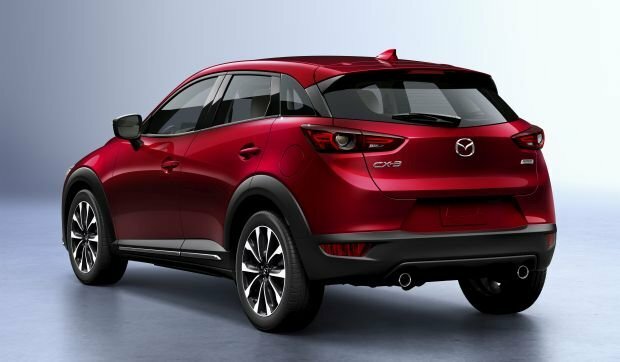 Barring that, don’t expect any notable changes for 2020 after the CX-3 received a significant midcycle refresh for model-year 2019. Introduced for 2016, the CX-3 is the independent Japanese automaker’s entry in the increasingly popular subcompact-crossover segment. To create it, engineers took the Mazda 2 subcompact hatchback car, raised its ride height slightly, and added all-wheel-drive (AWD) capability. CX-3 sales were weak out of the gate and haven’t improved much. Demand is up about 11 percent through October 2018 (in a segment up 36 percent), but Mazda is on pace to sell fewer than 20,000 CX-3 for the year. That’ll leave this crossover second to last in the class, ahead of only the woebegone Fiat 500X and far below the segment-leading Subaru Crosstrek, Jeep Renegade, Chevrolet Trax, Honda CR-V, and Ford EcoSport. Weak sales may not panic Mazda’s bean counters too much, though. The Mazda 2-to-CX-3 conversion is cost-efficient, and unlike its competitors, this independent Japanese automaker doesn’t heavily incentivize any of its vehicles. It lacks the financial resources to offer much cash back. And it knows that being stingy with discounts helps keep average transaction prices and resale values higher than the industry average. That in turn improves profitability and brand image. Wait to see if iActivesense becomes standard across the board. The package includes most of today’s key safety features: autonomous emergency braking designed to stop the crossover to mitigate a frontal collision with another vehicle or a pedestrian; adaptive cruise control to maintain a set distance from traffic ahead, even in stop-and-go driving; lane-departure warning, LED headlamps, automatic highbeam headlights, rain-sensing windshield wipers. On 2019 the CX-3, iActivesense was an $1,100 option on Sport models, a $1,000 option for Touring models, and standard on the top-line Grand Touring grade. Of course, making iActivesense standard would likely increase Sport and Touring base prices, which already trend a little higher than direct competitors. If you’re extremely price-sensitive and prefer to choose whether to pay extra for iActivsense, consider a ’19 CX-3 instead. It’ll have the same styling and performance as a ‘20, and likely will duplicate most features, too. Either way, your CX-3 won’t become dated until arrival of the next redesigned model, which won’t happen before model-year 2022 or 2023. No. because Mazda just updated the CX-3 for 2019 and the changes will carryover for 2020. This little five-seater was arguably the style leader in the class already, and the ’19 fresh only strengthened its case. Designers tidied up the front fascia with a simpler and more elegant new grille. They replaced a single, straight cutline across the body sides with multiple lines that flow gracefully to the rear. The cabin received a few tweaks as well. The center console was redesigned to accommodate an electronic parking brake and provide more small-items storage space. Uncorrected was the placement of the center armrest, which hovers over one of the cupholders, limiting the height of drinks that can be placed in it. Unfortunately, the balance of the interior is also likely to remain a mixed bag for 2020. The gauge cluster puts the tachometer dead ahead, sportscar-like. But this is the only analog instrument. The speedometer and fuel gauge are digital, and there’s no engine temperature readout. Apt to return as optional on the ’20 Touring and standard on the Grand Touring is a small, head-up display. It’s a plastic panel that deploys from above the instrument panel when the vehicle is started. It seems superfluous at first, especially since you can’t retract it on demand. But it provides useful information, including a warning light when a vehicle in an adjacent lane is in your blind spot. Radio and infotainment duties will continue to be handled through a tablet style display atop the center part of the dashboard. You can control it with a console-mounted joystick/knob/button combination, but Mazda recently added touch capability to the screen. This helps a lot when burrowing into the interface because some functions are buried in submenus. Neither Apple CarPlay nor Google Android Auto was available for the launch of the 2019 models, but Mazda promised to roll out software updates to add this functionality. There’s been no word as of this report’s writing when the CX-3 might receive it, but we expect all 2020 models to have it out of the box. Materials quality should remain first-rate. Grand Touring models received full leather upholstery as standard for 2019 (previous versions had a leather/imitation suede blend). And faux suede migrated to one of the dashboard panels, adding an extra dose of class. Front-seat occupants should again have adequate room. The CX-3’s high belt line can make you feel submerged. Raising the seats helps, but doing so intrudes on headroom, especially beneath the housing of the sunroof that’s standard on the Grand Touring and optional on the Touring. Things aren’t so good in back. Rear-seat legroom is near the bottom of the competitive set, and headroom is little better. Cargo volume should also remain at the back of the pack, with just 12.4 cubic feet behind the rear seats and 44.5 with them folded. No, given that the 2019 freshening included a few drivetrain tweaks. The sole engine/transmission combination will remain a 2.0-liter four-cylinder and a six-speed automatic. It’ll continue at 148 horsepower (an increase of two for ‘19) and at 146 pound-feet of torque. Torque output was unchanged for 2019, but more became available across a wider range of engine speeds. The happy result is slightly quicker acceleration from a stop and when merging or passing on the highway. Still, the ’20 CX-3 won’t be a speed demon, even with help from the standard throttle-quickening Sport button. Most rivals offer a continuously variable transmission or an automatic with eight or nine speeds. They benefit fuel economy, but we have no complaints with the behavior of the CX-3’s six-speed. It includes a useful manual override, and Grand Touring models get convenient steering wheel paddles. For 2020, we’d urge Mazda to add a few extra layers of sound insulation to bring the CX-3 in line with top rivals. The engine here is the primary culprit: it’s very loud at startup and when accelerating. Mazda improved upon CX-3’s already lively handling with the model-year-2019 addition of its G-Vectoring Control as standard. This subtly brakes the vehicle as you enter a corner to enhance stability. We’ve tested only models with 18-inch wheels and tires, which are standard on the Touring and Grand Touring (Sports have 16s). Grip is outstanding. Steering feel impresses too, with just enough feedback and a light feel at low speed for better maneuverability in the urban grind. Ninety percent of CX-3 buyers wisely choose all-wheel drive. With just 6.1 inches of ground clearance, this is not an off-road capable vehicle. But the AWD system notably enhances on-road handling as well as improving all-season traction. No. Expect EPA ratings to be unchanged, meaning the 2020 CX-3 should remain better than average in a class where fuel efficiency is a selling point. Look for 29/34/31 mpg city/highway/combined with front-wheel drive and 27/32/29 with AWD. The ’20 CX-3 won’t have as sophisticated a transmission as top rivals but it’ll again compensate by being admirably light, at less than 3,000 pounds, even with AWD. All models will continue to use regular-grade 87-octane gas. Not new, per se. Including iActivesense across the board would alter the CX-3’s standard-equipment scheme, but the 2020 would otherwise have the same roster of features as the ’19. Sport grades would come with the expected level of equipment for an entry-level crossover. Some of the standout items will again include keyless access with pushbutton ignition, blind-spot alert with rear cross-traffic detection, and autonomous emergency braking that works at speeds up to 19 mph. The Touring would add heated exterior mirrors, automatic headlights, 18-inch wheels (up from the Sport’s 16s), automatic climate control, rain-sensing windshield wipers, and heated leatherette front seats. The Grand Touring would include a power sunroof, LED headlights with automatic high-beam control, LED fog lights, leather upholstery, head-up display, imbedded GPS navigation, Bose-brand audio system, and a full suite of driver-assistance features, including high-speed automatic emergency braking. 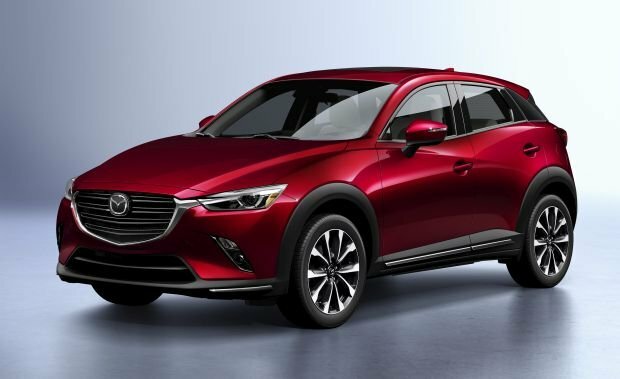 They’ll probably increase slightly for the Grand Touring, more so for the Sport and Touring should Mazda elect to make the aforementioned safety features standard rather than optional. Note that our price estimates include Mazda’s destination fee, which was $995 on the 2019 CX-3. With front-wheel drive, expect base prices of around $22,000 for the Sport, $24,550 for the Touring, and $27,000 for the Grand Touring. Expect AWD add some $1,400-$1,500 to each model. On all, anticipate the return of extra-cost paint colors that range from $200-$595. Dealer-installed rear-obstacle detection should cost $500, along with a $400 SD Card that enables imbedded navigation on the Sport and Touring models. The Touring would add automatic climate control and rain-sensing wipers. Likely to remain available separately for the Touring is the Preferred Equipment Package ($1,400 for 2019) that includes the power sunroof, Bose audio system, satellite radio, and a cargo cover that are standard on the Grand Touring. The Grand Touring would continue to offer its Premium Package ($710) that adds a heated steering wheel, power driver’s seat with memory positioning, auto-dimming rearview mirror, and traffic sign recognition. Look for a fall 2019 release date for the 2020 Mazda CX-3.